When I’m not scoping out the best sustainable brands and writing for Eluxe, I focus on sustainable styling over at my personal blog Sustainable Outfits. I find ethically made clothing created from the best eco-friendly and natural materials and put them into looks that everyone will want to wear. 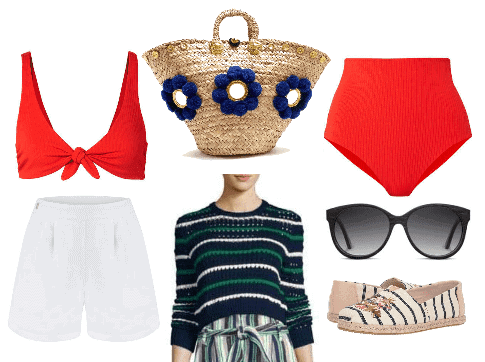 For this article, I’ve recreated what I do on my blog and styled 10 different outfits for various personalities that are perfect for your sustainably stylish day at the beach. Feminity has been associated with pink – it is pretty, soft, and fun, all at the same time. This outfit is all about the feminine – pink, pastels, florals, ruffles. It’s got it them all! Clube Bossa Bikini Top and Bottom Clube Bossa designs and produces everything in Brazil. They employ local craftspeople who hand-make every piece over the course of a day. Lemlem Kaftan handwoven by female artisans in Ethiopia who use traditional techniques to bring breezy elegance to your summer. Muuñ Bag Crafted with straw and cotton canvas by Ghanian artisans and finished at their studio in France. Sydney Brown Sandals : vegan and made sustainably. Ibo Maraca Hat handcrafted in Greece by master artisans who take up to eight hours to finish each hat. The hats also feature Greek art. This one has a blue and white floral motif by a Greek artist. Earth Wood Sunglasses made from Triacetate Cellulose, which is biodegradable. Is there a better place to wear Bohemian style than on the beach? This outfit is perfect for the Boho beach babe. It features flowing patterns, and pieces made by artisans that you could have easily picked up on your travels. Mes Demoiselles Dress made with handwoven fabrics created by ancient Indian techniques. Alienina Bags are handcrafted in Italy using recycled cotton rope. 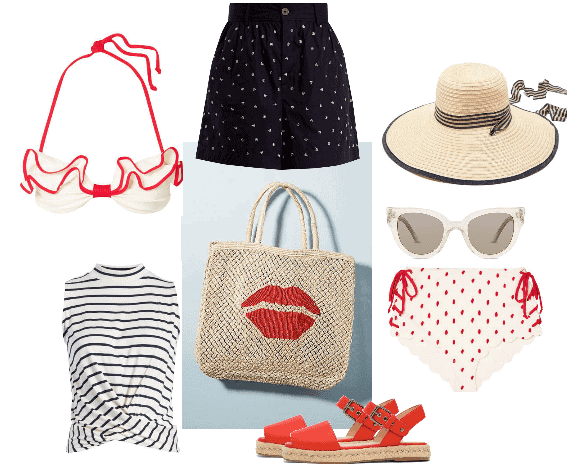 Soludos espadrille wedges are the perfect way to put some height on your look this summer. These are made from linen with a vegan rubber sole. 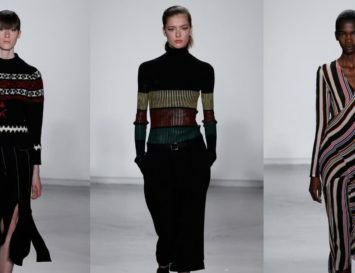 I’ve always admired the style of girls who can seamlessly combine colour to create a unique and interesting look, and these garments are perfect for the bolder stylista. Holland Street Kaftan handmade in London at Holland Streets ethical workshop. The fabric is natural, luxurious silk. Bait Footwear is 100% vegan and made faux leather. Lola Hats, handmade in Bushwick, New York and combine artisanal techniques with simple designs. Aranaz Bag brings traditional Manila craftsmanship to the global market. By employing local artisans to weave and hand-make each bag, they help to promote and protect the legacy of Manila craftsmanship. Annie Costello Brown Earrings Handmade in L.A. Annie Costello Brown runs small-scale production and oversees every part of the design process. These wavy earrings are handmade from blue oxidised brass. Preppy style is all about staying traditional. This look features stripes, solid colours, and an all-American fair. AMUR Sweater.- this sweater mindfully uses organic cotton. Toms Shoes donate a pair of shoes to a child who needs one every time you purchase a pair. Their slip-on shoes are just a classic, flattering style, and this pair is also vegan! Shwood Sunglasses -handmade in Portland featuring sustainably sourced dark walnut wood. These shorts are made from 100% linen. That’s the only fabric Dor Raw Luxury uses because they are drawn to it’s lightness and simple sophistication. They make sure that from the farm to the product, working conditions are fair, ethical, and respect nature. Muzungu Sisters Bag, handmade in Sicily with natural straw. Rockin’ roll right over to the sea shore! This look features all the textures and colours you’d associate with rock chick chic, and it wouldn’t look too far out of place at Coachella either. Kiini Bikini Top and Bottoms – designed in New York by Ipek Irgit, every Kimi swimsuit is handmade and feature hand crochet details. Stella McCartney Sunglasses , made with biodegradable acetate in Italy. Melie Bianco Bag, certified vegan by PETA, with high-quality artisanal craftsmanship that you might expect from real luxury leather. Janessa Leone Hat, made in the U.S. with ethically sourced wool. The factory where Janessa Leoné’s hats are made is employee owned and the profits are shared. Re/Done Shorts, created by taking apart old Levi’s from the seams and reinventing them to new jeans. Roses Are Red Kimono , handcrafted in Greece by skilled artisans. It also comes with a poem written by the designer! For the girl who is into fashion, it’s hard to stay away from a good trend. My rule for this year’s trends is if I know I’ll like it next year too I’ll still buy it. Case in point, Gingham, white dresses, and straw bags! Verandah Dress using artisanal fabrics woven on traditional handlooms in India. Kayu Bag made from natural and locally sourced vegan materials. Andy Wolf Sunglasses made from acetate derived from cotton and produced in Australia. Castaner Wedges are handcrafted in Spain, from rubber and woven jute. 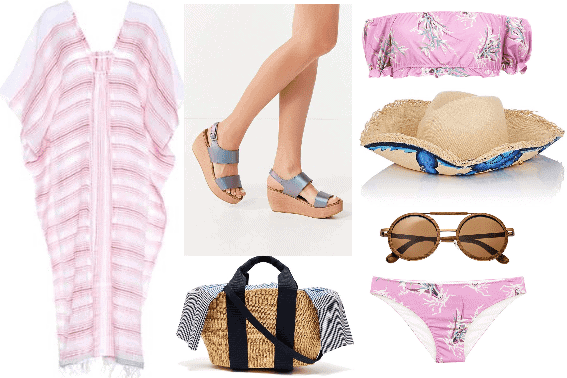 An outfit that chicly proclaims, “modestly is the cutest policy.” I normally wear bikinis or one pieces, but brands like Cenote and Seea have introduced me to the super stylish and covered ‘rash guard’. It’s great for standing out among a sea of uniform bikinis and for keeping your skin sunburn free. Cenote Leggings made from sustainable materials like recycled nylon. Nannacay Bag ‘Nannacay’ means sisterhood of women in Quechua. The brand is both a social project, bringing together female artisans in Peru, and fashion brand, creating cute woven bags that are eco, and fashionista-friendly. Sunski Sunglasses, made with recycled plastic material to make sure that your eyes are environmentally friendly. SOLE Flipflops are made with PU and sustainably recycled cork. The minimalist aesthetic is all about what you actually need. Limited, functional accessories, simple clothing with simple silhouettes. It’s a style that is more low key, but definitely timeless. BC Footwear Sandals Certified by PETA, BC Footwear is 100% vegan and made in an eco-friendly, cruelty-free environment. Vitamin A Bikini Vitamin A are so cool – theyy use their own regenerated nylon fabric called EcoLux to make their swimwear! Skin Jumpsuit made from natural pima cotton. Cuyana Hat made by local artisans who use handwoven, real toquilla straw. Ulla Johnson Bag made from sturdy black wicker. 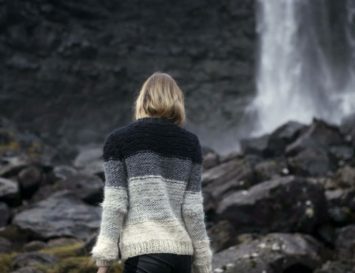 Like all of Ulla’s timeless pieces, this one is hand-woven using unique artisanal processes. Blue Planet Eyewear, made with eco-friendly recycled plastic. Blue Planet also gives sight to children in need with their buy-to-give Visualize Change program. Swimming is one of the healthiest, low impact exercises you can do. And what’s a more fun way to burn calories and work muscles than in the comfort of the water? This look is for the girl who loves to get her exercise through swimming. Stella McCartney X Adidas One Piece from the collaboration between Stella McCartney and Adidas. It’s made of recycled nylon. Stella McCartney Backpack Another Stella McCartney item, but this one is made in ethically in Italy using vegan alter-nappa leather. Veja Sneakers, made with organic cotton and wild Brazilian rubber. They are then produced at the Veja owned certified fair trade factory. Orwell + Austen T-shirt Orwell+Austen use a GOTS certified organic cotton supplier for their slogan tees. PACT Joggers made 60% certified organic cotton, 40% recycled polyester. Pala Sunglasses Made with recycled plastic waste by artisans in Ghana, this sunglasses brand is socially conscious too. For every pair of sunglasses sold Pala gives back a pair of prescription glasses to people in need via outreach projects in Africa, including their own vision centre in Muchinga, Zambia that serves a population of over 75,000. There is something so timeless in the style of the 1950’s. The colors are classic, styles are figure flattering, and just a little cheeky. To bring these to an outfit, I choose a classic red, black, and white color palette, and waist-defining high-waisted styles. Carla Colour Sunglasses, made sustainably with cotton-based zyl acetate. Filu Hats , handmade in Italy by local artisans with natural blended straw. This hat also features one of Dianora Salviati hand-painted scarves. Matt & Nat sandals, made with vegan PU, Matt & Nat has been producing simple, stylish vegan fashion since 1995. Jupe by Jackie Shorts, using traditional Indian embroidery and textiles. Amour Vert Tank made with modal and nontoxic dyes. The brand also plants a new tree every time you purchase something.